Claude is a client of mine who owns a successful tutoring service in Eden Prairie, MN. He's building his business using a series of 5 emails I created for him to send out to prospects. I signed up one customer last week for 25 hours after sending the first two emails in the series. It is a good thing that I followed up with a phone call as the emails had gone into the customer’s junk email. He was embarrassed but grateful that I took the time to call. He was a an easy acquisition. The emails did play a part in the process. Another lady has promised to give me an answer about transferring her two daughters from a competitor. She called back two days after the first email. She is looking at 100 hours. If she signs up that is a home run. The email templates definitely played a role in acquiring these two customers. It is so much easier to respond on a timely basis using the templates. Being a slow typist it would take me an hour to draft an equivalent email. And of course I do not have the outstanding writing skills that you do. 1) You must follow up systematically with prospects by email. For Claude, I wrote a series of emails that he sends out, in order, to every prospect. It's the same sales message every time. He doesn't have to wing it or wonder what to write. It's done for him. As you can see above, these emails are paying him back -- big time -- in sales he otherwise might have lost. Manually, as Claude does. This can work with your average sale is pretty high and it's worth the 20-30 minutes a day it takes to systematically send out emails to all prospects in your funnel. Automatically, using an autoresponder service like Aweber (which I use and recommend). This is more technically involved, but it's the same principle: Once a prospect gives you permission to contact them, they should get a series of automatic emails to educate and convert them into clients. Because the best email in the world won't help you if it ends up in your prospect's spam folder. So, if you charge more than, say, $20 for what you do, and you have the prospect's phone number, call them at least once during your follow-up process. 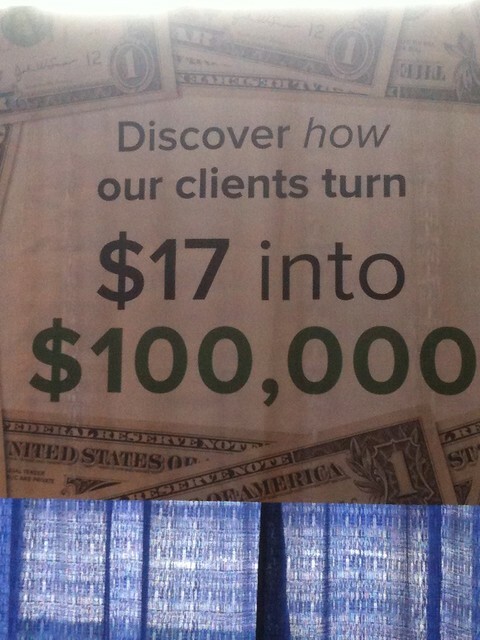 The headline on this banner stopped me cold: "Discover how our clients turn $17 into $100,000"
It was hanging above a booth at a marketing conference. I was compelled to walk over, talk to the guy at the booth, and find out more. The heart of any marketing effort is the headline. And the goal of any headline is simple: To stop your prospects cold, so you can warm them up with the rest of your presentation. In this case, mission accomplished. That's the example above. The first, big, attention-getting words on any banner (offline or online) or print advertisement (in publications or on Web pages that resemble print publications). If it doesn't attract your prospects' attention, they pass you by. The subject line in your email. If it doesn't immediately intrigue prospects, they won't read your email. The first words in any printed sales letter you mail with a stamp. If your opening salutation (Dear Kevin) and first sentence don't grab readers, they won't read your sales letter. The first words out of your mouth when speaking to a prospect by phone or via a radio ad. If you don't engage prospects with your first 1-2 sentences, they tune you out. Do you see the consequences here? If your headlines don't attract attention -- whether online or offline -- your prospects ignore you, and your efforts are wasted. Failure is costly. Solution: Put as much time and effort into creating your headline as you do creating the rest of your ad. You read that right -- if you spend 3 hours writing the ad itself, devote another 3 hours to researching and writing headlines. Because, if your headlines don't work, your ads can't work. According to Investopedia, a strangle is "an options strategy where the investor holds a position in both a call and put with different strike prices but with the same maturity and underlying asset." In other words, a strangle position lets you make money whether the price goes up or down, like buying and selling the same stock. It's a contradictory idea that savvy investors use to make money. What contradictory ideas could you explore to make money in your business? For example: How could you buy and sell your clients? Well, you could "buy" clients by offering cash bounties to anyone who sends you a new client. I've done it for nearly 15 years. And you could "sell" clients by doing joint ventures. Find a business you trust, one that offers something useful that you don't provide. Then, endorse that business to your clients in exchange for a share of revenue. I've done this for years, too. Don't get me wrong. It is NOT okay (or legal) to "sell" your clients' personal data or "sell them out" by endorsing a piece of crap just to make a buck. However, there's no limit to your success when you "buy" and "sell" clients effectively. It lets you enjoy both sides of the equation, just like a "strangle" in stock options. give away and charge for? I've never been a big fan of the 4 Ps of the marketing mix: Product, Price, Place, and Promotion. I'm naturally suspicious of any marketing theory that's taught in colleges and followed by big, dumb corporations. Instead, I follow a simpler marketing formula, tailor-made for small businesses and solopreneurs. I call the formula The 3 Ms: Market, Message, and Mechanism. Market = To whom are you selling? Your best market is the people who know you, trust you, and want your business to success -- your clients, past and present. As copywriting legend Gary Halbert once said, if you're selling hamburgers, you don't want the best beef or the lowest prices ... you want a starving crowd. That's your ideal market. Message = What do you say or write? Here's how to budget your time when creating a message: If I spend 6 hours on a 3-page email promotion, about 2 hours are research, 2 hours are devising an offer and headline, and 2 hours are actual copywriting. Mechanism = How will you deliver this marketing message to your market? Here are example delivery mechanisms: email, direct mail, seminars, phone calls, webinars, print ads, LinkedIn, Facebook, Twitter, etc. When you map out on paper these 3 Ms -- Market, Message, and Mechanism -- then assign deadlines and budgets, you'll have a clear plan for selling more of your product or service. Try it. Here's a Google AdWords writing question I answered from a small business owner, which could apply to your business. Question: Please let me know which potential Google AdWords ad is better for my business (www.xyz.com). If you feel one of these 3 won't get a high click-thru, we are open to your suggestion. Thanks! Want to sell to Retail? Answer: After writing more than $314,054 in Google AdWords ads over the years, I can tell you the answer is: It doesn't matter. It doesn't matter what I think, or anyone thinks. Problem: You can NEVER know this in advance. Solution: The market will tell you the right answer, with 100% accuracy. All you have to do is test. First, track all the actions connected with your AdWords ad (using Google Analytics), then start testing different combinations of headlines, body copy, and domains (in that order). Got a Product to Sell by Retail? ... but remember: You can't put predictions in the bank. Only dollars. And you get those dollars by TESTING exhaustively until you get the results you seek. FYI, as my schedule permits, I do write Google AdWords for clients in the Twin Cities of Minneapolis and St. Paul, and across North America. Buying one hour of my time for $195 will give you at least 20 different Google AdWords ads to test -- that's enough to produce a slew of new sales for you. And if you don't love the results, you pay nothing. To learn more about this Google AdWords writing service, contact me today. Just like your first kiss, you never forget your first unique selling proposition (USP). Mine was in June 1988, in England. The nice lady at the youth hostel in London told me it would be easy to hitch a ride north on the M1. "Just walk out to the motorway entrance with a sign that says, 'STUDENT.' Drivers pick them up first." Obediently, I wrote STUDENT in black magic marker on a piece of cardboard, took a cab to the M1 entrance, and ... found a line of about 10 other hitchhikers waiting for rides -- all holding signs that said "STUDENT." "How long have you been here?" I asked the guy in front of me. "About 20 minutes," he said. "I wager it'll take an hour for everyone ahead of us to get picked up." I took out my magic marker, wrote "AMERICAN" on my sign, and held it up high. I kid you not -- within 2 minutes, a car drove past the 10 STUDENTS and stopped right in front of me, the only AMERICAN STUDENT. If dirty looks were knives, I would have been stabbed 50+ times by the other hitchhikers as I threw my rucksack in the boot of the car. You can market like everyone else in your industry and wait for clients to pick you from a lineup of sameness ... or you can find a way to stand out. A strong USP does that for you. The headline is intriguing: "What Do You Get The Man Who Has Everything?" But the offer is hard to mess up -- a two-day stay and four rounds of golf at legendary Pebble Beach. 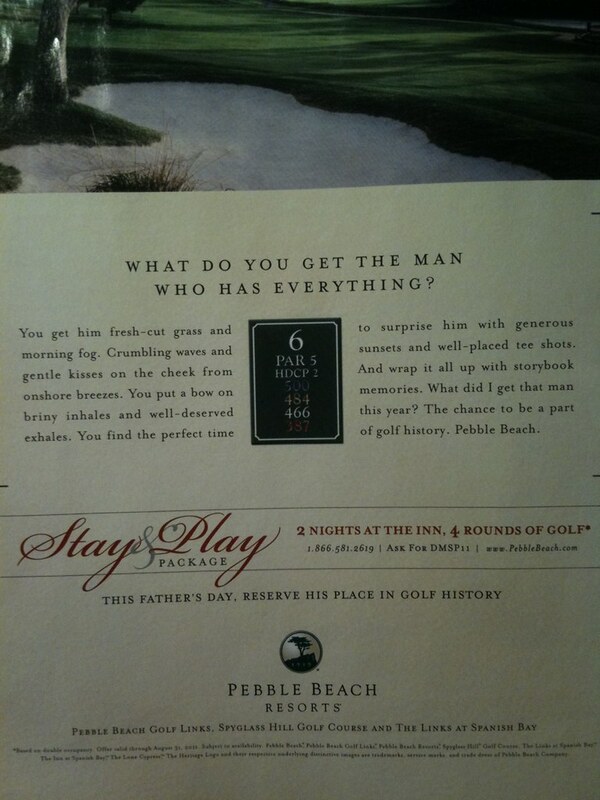 For Father's Day, if your dad or husband loves golf -- and money is no object -- this offer can't be beat. Notice the price? There isn't one. That's because ... this offer can't be beat. It's in a category of one, so price means nothing. What do all these "priceless" offers have in common? Timing. Golf at Pebble Beach is always a nice gift for the man who loves golf, but irresistibly so if you give it on Father's Day. The great gift becomes priceless. Timing can vault your product or service into its own category of one, where price means nothing -- and money is no object. Now. How will you use this idea? There's more where this came from in my Free Report, Guaranteed Marketing. Who - Who is your target client? Who are you? Whom do you donate 5% of profits to? What - What do you do? What don't you do? When - When are your office hours? When will you meet clients? Where - Where is your office? Where will you meet clients? Why - Why do you do what you do? Why did you open your business? How - How fast/slow/expensively/cheaply/high-tech/low-tech do you do what you do? None of these is trivial. Each has the makings of a unique selling proposition, or USP. Your USP is the answer to the question in your prospect's mind: "Why should I give my money to you and not some other business?" To illustrate, let's pick where from the list above. You might not think twice about where you work. But at the Bartlit Beck Herman Palenchar & Scott law firm in Chicago, their office includes a basketball court, which delights clients -- and sets their firm apart. We call the basketball court the Forum, like the one in ancient Rome where people would come to exchange ideas. We have 10-foot whiteboards, movable tables and chairs and network connectors built into the floor. We can sweep it all away at any minute to pick up a game of basketball. Clients travel here all the way from New York and Los Angeles. They eye that basketball all day and finally someone rolls the ball that's been sitting in the corner. They smile. They take a shot. Pretty soon we're scrambling to protect the laptops and overhead projectors! Next time they come, they come without the tie. Do clients travel from either coast to visit your office? I'm not saying that a basketball court is a marketing panacea. But ... if your USP is strong enough (and your services good enough), you can attract clients like kids to a playground. You can't say a lot of good about ignorance. Except when you're trying to solve a problem. 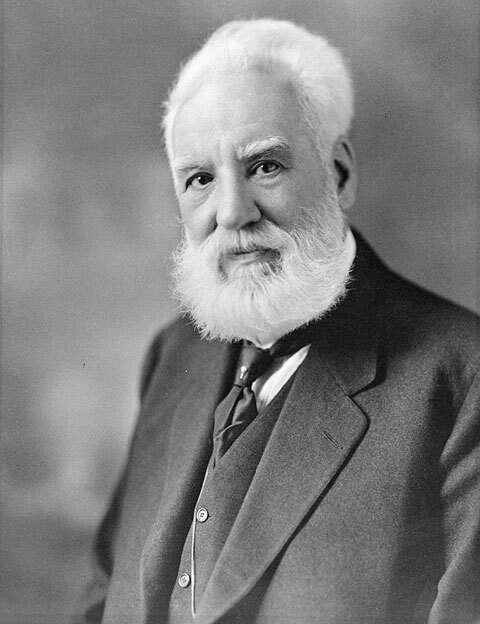 Example: Alexander Graham Bell invented the telephone -- because he didn't know any better. In 1863, a German inventor, Hermann von Helmholtz, wrote a paper: "On the Sensations of Tone as a Physiological Basis for the Theory of Music." Bell, reading a bad translation of the German, thought Von Helmholtz had invented a way to send vowel sounds over an electric wire. But Von Helmholtz had only developed a theory, not a device. So Bell pressed on -- blissfully ignorant -- with his own painstaking experiments to transmit human speech by wire. He later said, according to Wikipedia, "I thought that Helmhotz had done it ... and that my failure was due only to my ignorance of electricity. It was a valuable blunder ... If I had been able to read German in those days, I might never have commenced my experiments!" Now. What's considered "hard" or even "impossible" in your business? How would you do solve that problem if you didn't know any better? Write down the first 3-5 ideas that come to mind. And prepare to be surprised at the insights you get. Note well: "creative ignorance" may not help you invent anything as earth-shattering as the telephone. But, if you break an "impossible" problem into smaller parts, and attack each one as if you knew you couldn't fail ... you might just set your marketplace on its ear. I took time over the long Fourth of July weekend to re-read parts of Will and Ariel Durant's majestic "The Renaissance ," especially the section on Leonardo da Vinci. Like many folks, I admire genius. And I wonder: What makes one man or woman surpass the rest of us in music, art, sports, or ... business? In order to draw well he studied all things in nature with curiosity, patience, and care; science and art, so remarkably united in his mind, had there one origin -- detailed observation. But indeed he was interested in everything. The bold emphases, on "detailed observation" and "interested in everything," are mine. 1) What do you carefully observe each day? 2) What are you intensely interested in? The answers will, I think, tell much about how likely you are to succeed in your business. If you carefully observing most of what you do, with intense interest, you likely have enough internal drive to power through the obstacles that derail your competitors. If, however, you find yourself daydreaming or wishing you were elsewhere each day, you should outsource those tasks that keep you from your passion. Or ... is the secret to "genius" no secret at all? Speaking for those of us who failed math and can't draw, I prefer this quote from Leonardo's rival, Michelangelo: "If people knew how hard I worked to get my mastery, it wouldn't seem so wonderful at all." I write and speak all the time about what I call "Thank-You Marketing." ... just like holding hands makes the object of your desire more receptive to a kiss. Occasionally, I get flak from people who snark, "Mail a thank-you note? You're kidding right? That's no secret." I never said it was a secret. But ... are you doing it? The reply I usually get is, "I don't have time to write and mail thank-you notes." That's no excuse at all, of course. The same people who can't find 2 minutes to personally thank a valued client or referral partner by mail, can always find 20 minutes to check Facebook, 60 minutes for leisurely lunches, and 2-4 hours for TV every night. And I am all about saving time whenever possible. So ... if you can't spare 2 minutes to write a thank-you card, surely you can find 60 seconds to write a postcard. On the front, after thanking me for my business, they offer me a $10 credit for referring my friends. Good idea. But they get points off for the weasel words ("Restrictions may apply") and for limiting(!) my referrals ("One per customer"). Still, this is better than nothing. Total time to write a 19-word message, address this, and affix a stamp: 60 seconds or less. The potential ROI: Very great. Whether you use standard thank-you notes or custom-printed postcards, the only way to know if "Thank-You Marketing" can work in your business is not to say, "I know that," but to actually try it. Today is the first day of Q3 2011. If you're interested, I've written here and here about Kaizen Marketing.